Bet 365 is a site which caters to the serious poker player. They offer their most skilled members extra rewards through their lineup of special tournaments and sit & go competitions. However, newcomers are also welcomed nicely at the site and players who do not want to make gigantic buy-ins will also find plenty of action. Bet 365 has tournament entry fees which can fit every poker player’s budget. This is a site that concentrates the action on just a few of the most popular poker variations. While some casinos offer a dozen or more different games, Bet 365 has just seven games to choose from. There is of course Texas Hold ’em, plus four stud games, 5-Card, 7-Card, 7-Card Hi/Lo and Razz. There are also two versions of Omaha that are available at Bet 365. You can play the regular Omaha game, also known as Omaha Hi, and you can play Omaha Hi/Lo, which is also known as Omaha 8. It is harder to get a huge win in Omaha 8 because the pot divides every time there is a valid low hand. It’s also not unusual for the pot to divide more than two ways. The low hand in Omaha 8 will frequently have a split pot. With the divided winnings, Omaha 8 can sometimes be a frustrating game to play It’s not unusual to be one of the low winners and still lose money on a hand. However, even if you weren’t expecting it, sometimes you can win the pots for both the high and low hand. You can find a number of major nulti-table tournaments to enter at Bet 365, with hundreds of thousands to be won every month. But if you prefer sit & go events, Bet 365 always has a lot to offer you. They have a series of sit & go’s which offer progressive jackpots, These tournaments, known as the Dirty Dozen, Maui, Rio and Fort Knox, all offer huge payoffs to any player that can win a certain number of consecutive events. The buy-ins to the Sit & Go Jackpot events are quite reasonable, beginning for as little as €2.00. The entrance fees and the number of wins required for the progressive payoffs vary for each one of these tournaments. The amount of players you have to beat in each tournament also varies. The Sit & Go Jackpot payoffs range from €2,000 to as much as €35,000. 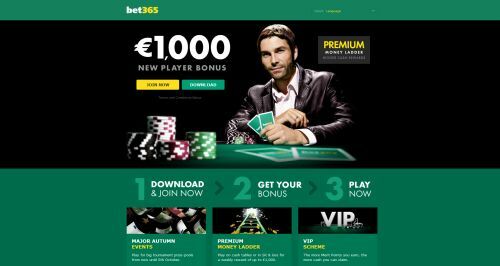 Bet365 are more than just a poker room, they offer a sports betting, casino games and bingo. For a review that encompasses these other online gambling options take a look at LCB’s Review.